We've updated our 2012 NBA Mock Draft. The addition of Andre Drummond makes an already strong draft class even stronger and it now could go down as one of the best drafts of all time. There could be at least 4 or 5 potential superstars, assuming players like Anthony Davis and James McAdoo enter the draft after just one season in college and there is solid talent well into the second round. 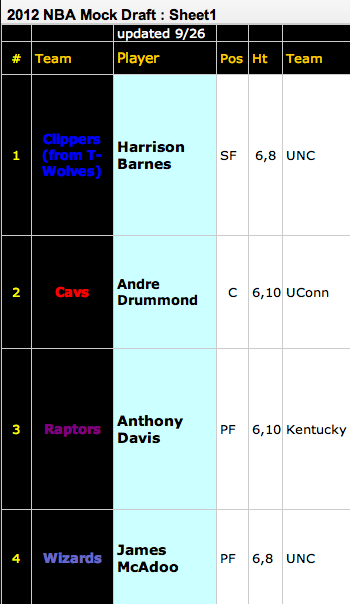 Harrison Barnes remains the projected #1 overall pick, even with the presence of Drummond, who projects at #2. Anthony Davis has the talent to be a #1 pick in most years but projects at #3 in this strong draft class. Forwards James McAdoo and Jared Sullinger round out the top five. If the NBA ever gets it's act together and reaches a deal to play basketball this year there will be a lot of focus on which teams are losing enough to have a shot at a top 3 pick in next year's draft. Landing a player like Barnes, Drummond or Davis would change the fortunes of any franchise and could elevate this year's NBA losers into future title contenders. Everyone wants to see there team win - but this year losing could be the best recipe for future success.